Madison County is a county of the U.S. state of Alabama. As of the 2010 Census, the population was 334,811, making it the third-most populous county in Alabama. Its county seat is Huntsville. The county is named in honor of James Madison, fourth President of the United States and the first President to visit the state of Alabama. Madison County covers parts of the former Decatur County. 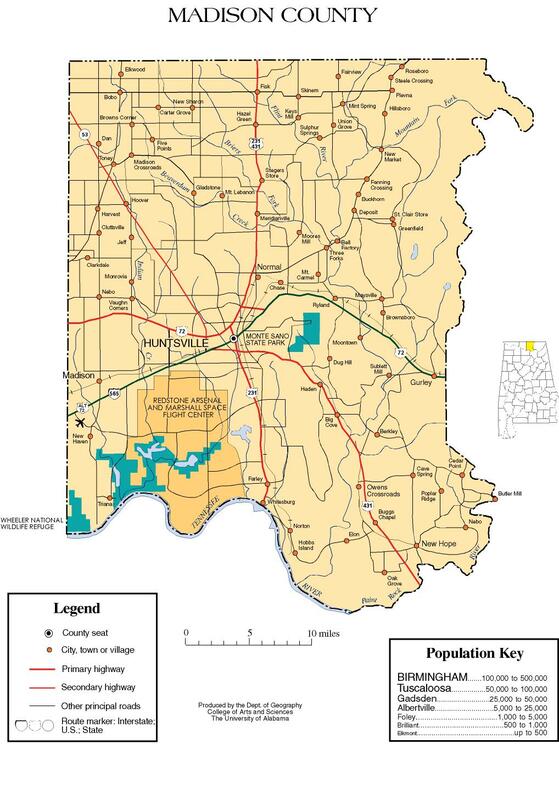 Madison County is included in the Huntsville, Alabama Metropolitan Statistical Area. Madison County was established on December 13, 1808 by the governor of the Mississippi Territory. It is recognized as the "birthplace" of Alabama, which was founded there on December 14, 1819. For much of the county's history, the economy revolved mainly around agriculture. Madison County was one of the largest cotton-producing counties in the state, and textile mills operated around the county. This changed when a group of German rocket scientists, led by Wernher von Braun, came to Redstone Arsenal in 1950. They developed, among others, the Redstone rocket, which was modified to launch the first two Americans into space. Tens of thousands of jobs came to the area as a result of the Space Race, and the population of Madison County rose from 72,903 in 1950 to an estimated 2015 population of 353,089. According to the U.S. Census Bureau, the county has a total area of 813 square miles (2,110 km2), of which 802 square miles (2,080 km2) is land and 11 square miles (28 km2) (1.4%) is water. As of the census of 2000, there were 276,700 people, 109,955 households, and 75,319 families residing in the county. The population density was 344 people per square mile (133/km2). There were 120,288 housing units at an average density of 149 per square mile (58/km2). The racial makeup of the county was 72.06% White, 22.78% Black or African American, 0.77% Native American, 1.86% Asian, 0.06% Pacific Islander, 0.59% from other races, and 1.89% from two or more races. Nearly 1.91% of the population were Hispanic or Latino of any race. There were 109,955 households, out of which 33.00% had children under the age of 18 living with them; 53.40% were married couples living together, 11.80% had a female householder with no husband present, and 31.50% were non-families. Nearly 27.20% of all households were made up of individuals, and 7.40% had someone living alone who was 65 years of age or older. The average household size was 2.45, and the average family size was 3.00. In the county, the population was spread out with 25.60% under the age of 18, 9.40% from 18 to 24, 31.50% from 25 to 44, 22.70% from 45 to 64, and 10.80% who were 65 years of age or older. The median age was 36 years. For every 100 females, there were 95.30 males. For every 100 females age 18 and over, there were 92.10 males. The median income for a household in the county was $44,704, and the median income for a family was $54,360. Males had a median income of $40,779 versus $26,534 for females. The per capita income for the county was $23,091. About 8.10% of families and 10.50% of the population were below the poverty line, including 14.10% of those under age 18 and 9.60% of those age 65 or over. There are a number of private schools serving Madison County. These include Randolph School, Madison Academy, Westminster Christian Academy, Faith Christian Academy, and several others. Madison County was formerly an overwhelmingly Democratic county as with most of the rest of Alabama, with only a narrow loss by Al Smith in 1928 due to Prohibitionist anti-Catholicism disrupting this trend until the 1960s. Even in 1964, the county nearly voted against Barry Goldwater due to its opposition to the Arizona Senator’s privatization plans for the Tennessee Valley Authority. However, since that time the county has become solidly Republican due to opposition by its white majority to Democratic Party social liberalism, with the only national Democratic nominee to carry the county since 1960 being Deep South native Jimmy Carter in 1976. Madison County is home to Monte Sano State Park, the U.S. Space & Rocket Center, and part of the Flint River. It also contains Hampton Cove Golf Course, part of the Robert Trent Jones Golf Trail. There is a historical marker for Lincoln School and Village which were incorporated into Huntsville in 1956. ^ "Commission Chairman". Madison County Alabama. Retrieved 7 July 2017. ^ Alabama Historical Marker: Lincoln School and Village. Wikimedia Commons has media related to Madison County, Alabama. Madison County map of roads/towns (map © 2007 Univ. of Alabama).